Developer: Bethesda Game Studios, Behaviour Digital Inc. Fallout Shelter was released a while back now for mobiles and when it was announced I hopped on the bandwagon and got it straight away, mostly because it's free and also because I love Fallout 4, it's a pretty simple game and kept me entertained for a number of weeks but that's all, I'm not slating the game in the slightest but it's not the most entertaining game out there is it? 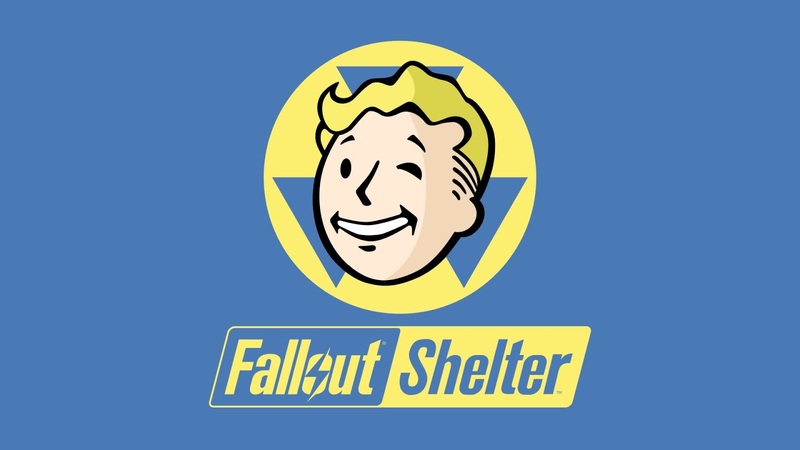 I'm going to give a full disclosure now I haven't got as far as most people with this game as I have far more interesting games to play through and Fallout Shelter is a game I usually play to waste a little time. Since playing the mobile version I knew what kind of game it would be so I wasn't surprised that I still didn't enjoy it as much, to be honest, but what I want to emphasis on is this is a personal opinion you don't have to agree. 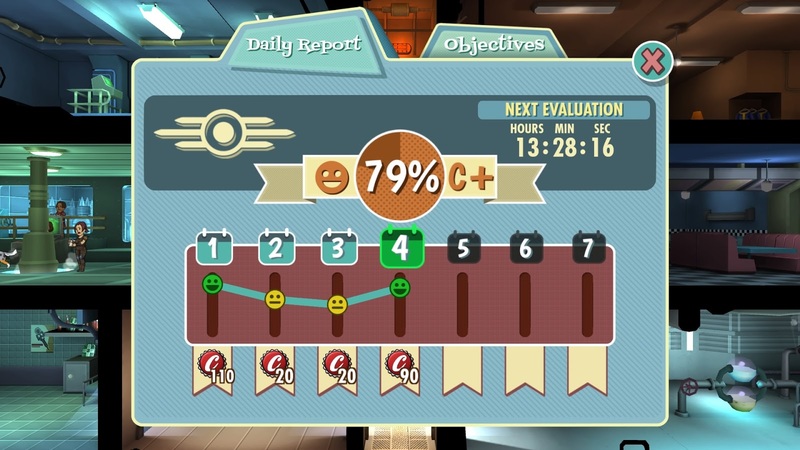 The game lets you see Fallout from a different perspective than before, you are in total control of your vault, you even get to choose which number to give it, I chose 15 as I randomly picked a number. Once you enter the vault it's empty and a tutorial will explain how to run the vault, you can turn the tutorials off but they will benefit you massively by following them. Money doesn't come easy and you will need to have enough in order to buy different rooms such as a water treatment plant, cafeteria and a power source room, the more citizens and money you have the more rooms you will be able to unlock. 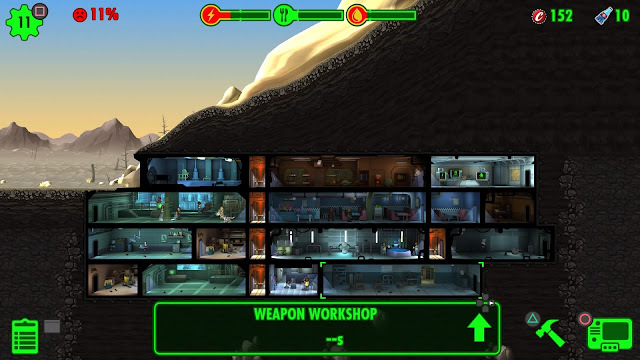 After building the main rooms you will need dwellers to work for you inside the vault, it's their job to keep things moving, maxing out how many people you can have in a room will speed up the process and at times the dwellers will die, either from trying to put out fires, fighting roaches or fighting against raiders that enter the vault, you can pay to revive them which can get expensive or remove them, but once you remove them the number of dwellers you have will decline and you will either need to make more babies in the vault, use a radio station to get the message out that you welcome people, go out and find people or just wait for them to turn up at the vault which can take a while, your best bet is to keep making babies, it's the fastest way to grow your number of dwellers. 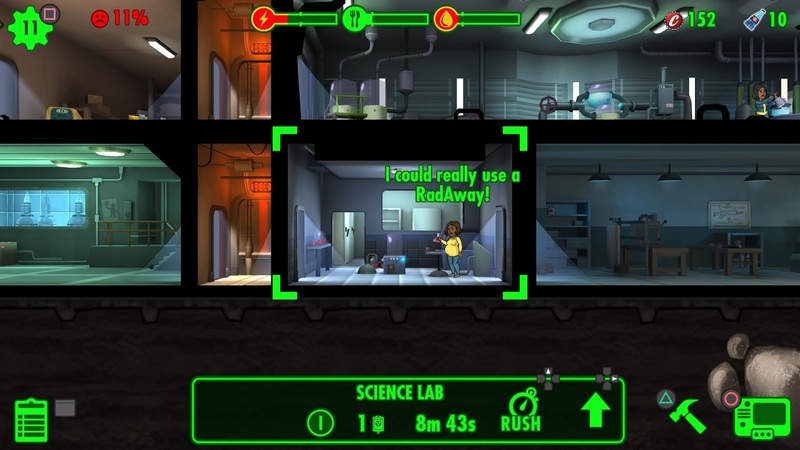 It can get tedious having to keep up with your resources as they dwindle very quickly and keeping up can be a little boring, I found that when I was on top of everything and it was going smoothly things would quickly change and my whole vault would either break out in roaches or randomly start burning for no reason. You're able to equip your dwellers with guns and outfits, even pets and you can also sell these to make a little more money or complete objectives, talking of objective some of the ones you are given to complete force you to sell things you may need or you can just wait until you have collected stuff you don't need to sell but even that will take time, basically this game involves a lot of waiting unless you speed things up in the rooms your dwellers work in, even then it can lead to disaster and be hit and miss as to whether or not you will have a successful or failed sped up room. Luckily the game tells how likely an incident would be if you were to speed things up. I'm terrible at this game, I don't have enough patience to stay too invested because it's such a slow game and involves a lot of waiting, I know a lot of some people who have been able to speed up the process and trophy such as the time exploit where you go into your PS4 settings and change your date and time manually, it may be a great way in order to get through the game faster but I'm not going to change my settings just to cheat my way through a game. There is a lot to do within the vault but personally, I found that it dragged on a lot, great as a mobile game or even a PS Vita game but as a PS4 game I felt like I needed more in order to keep me wanting to come back and play. There is one main feature I enjoy and that is being able to control the dweller that's been sent out, you can go into different rooms in buildings and collect supplies and even watch your dweller fight monsters while they are exploring, it can be very short lived though because you can either send the dweller home when things get too much and not complete the objectives or stay and risk running out of stimpaks which can be a little exciting but risky at the same time. Sometimes when you're overseeing the vault a man will appear creeping around and disappear as fast as he appeared, if you're able to find and click on him in time you're rewarded with caps which can be a huge help inside the vault. 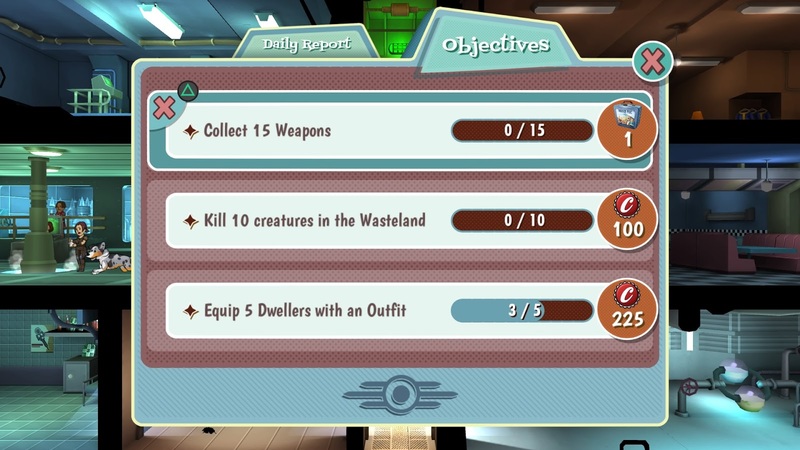 Each day you go to your vault you will be greeted by a daily report which will tell you how many caps you get for how well you are running the vault, mine have mostly been low as I'm not doing great at it, by pressing circle you can choose from a number of options one of them being a survival guide which will show you what guns, outfits, junk, pets and dwellers you have collected throughout the game so far. There is a help guide which breaks down the game and explains what you need to do, so in case you turn off the tutorial you can check here to find out more information and you will also be able to see your stats which breaks everything down and gives you a rough estimate of what to focus on. 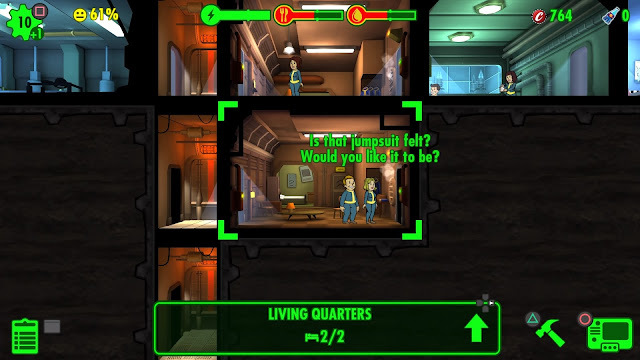 My vault doesn't have many rooms or dwellers yet because I'm terrible at this game and I just can't be bothered to invest hours into making it work, much like the mobile version, but I still sit and play it to try and improve and give it a chance. 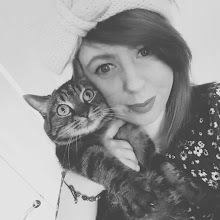 I'm not the kind of person to completely write off a game just because I'm not enjoying it, I will give it a go as many times as I possibly can. I need a game with a little more substance that will keep my attention for longer. It's not the worst game in the world but it's one I will forget in a hurry and replace with something more entertaining like going back to Fallout 4 and exploring the commonwealth, I give this game 3/5 stars, perhaps one day I will become more invested in it.